When Beth, a Protestant, accepted a marriage proposal from John, a divorced Catholic, he was unwilling to go through the long annulment process, so they married in her church. Without a decree of nullity from his first marriage, John felt uneasy attending mass. Beth noticed her husband’s spiritual battle but was uncertain how to support him in his faith. Although “cradle Catholics,” Paul and Susan had not attended mass since starting college. When Susan tearfully announced she was pregnant, they made quick plans to be married in the college’s non-denominational chapel, not taking the time to find a priest or get dispensation. After the baby was born, they realized the importance of their faith and wanted to have their son baptized. Even though they wished to return to the Church in order to raise their son in the Catholic faith, they were anxious about approaching a priest. The Code of Canon Law, the official rulebook of the Church, sets forth the approved form of the wedding ceremony. Baptized Catholics are to marry in a proper church building or at a shrine or sacred grotto with a priest or deacon officiating, unless they request dispensation from this required canonical form. Without dispensation, Catholics who are married by non-Catholic ministers (or officials such as a justice of the peace or a ship’s captain) are not considered by the Church as validly joined in a sacramental union. The same holds true for divorced Catholics who remarry without first obtaining a decree of nullity from their first marriage. Catholics are bound by canon law to marry only under certain conditions. Thus, for a Catholic, marrying outside the Church is considered grave sin. The Catholic who chooses to disobey the dictates of the Church is no longer considered to be in a state of grace and cannot receive holy communion. This can be a serious hindrance to the Catholic’s spiritual growth. Being married in the eyes of the Church also involves more than just paperwork. The government sees marriage as a legal contract that can be easily broken. 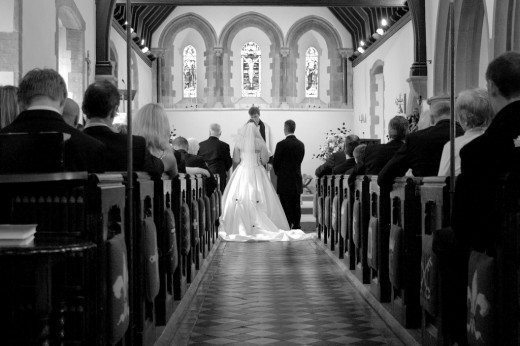 In contrast, the Church views marriage as a sacrament instituted by God, a permanent covenant between husband and wife. Catholics who want their marriage recognized as this permanent and sacramental covenant should begin the convalidation process by making an appointment with their parish priest. Although convalidations are handled differently from diocese to diocese, the Church’s Code of Canon Law governs the main guidelines. There are basically seven steps involved. First, all Catholic spouses must produce new copies of their certificates of baptism. These can be obtained by requesting a copy of the baptismal record from the parish where the person was baptized, indicating the name of the individual (as well as the names of the parents), date of birth and approximate baptismal date. This usually takes only a few days. It may be necessary to seek an annulment (or declaration of nullity) from any previous marriages, if the former spouse is not deceased. A favorable decision is needed before a convalidation ceremony can be scheduled. The priest, or a delegate, will help the petitioner with this process, which can take six months or longer. There is a shorter form for any Catholic who married outside theChurch. A formal annulment is usually not required in this case. The diocesan tribunal ordinarily processes that application in a few days and returns to the petitioner a declaration of nullity based on what is called a “lack of canonical form.” After obtaining an annulment, the Catholic is now free to have the Church convalidate a legal marriage which has already taken place. Paul reiterates this truth in I Corinthians 6:16b-17: “The two will become one flesh. And he who unites himself to the Lord is one with Him in spirit.”From these passages of scripture, it is clear that God intended Christian marriage to mirror the relationship of faithful love believers share with Christ.According to the Church, then, marriage is much more than just mutual consent. It is a grace-filled union that parallels the kinship of love between God and His people, but only within the confines of a truly sacramental marriage. Canon law also requires some kind of preparation for entering the sacrament of marriage. Individual dioceses establish the guidelines for this preparation. This can range from attending a short convalidation workshop and/or a pre-marriage readiness day to a Marriage Enrichment weekend or even private counseling sessions. This is in addition to completing all the necessary paperwork such as marriage investigation, inquiry form, or premarital documents. The next step is to attend the sacrament of reconciliation to confess and repent. Many Catholics who married outside the Church may be hesitant because of their long absence from this sacrament. A sympathetic priest will be able to assist the penitents in confessing to God what is in their hearts. Absolved and forgiven, they leave the confessional with lighter spirits and a clean conscience. Finally, celebrate! The convalidation may take place at the main altar during mass or in a shorter ceremony afterwards. The couple may also choose to have the ceremony at a shrine or sacred grotto that holds special meaning for them. The priest or deacon who presides uses the Rite of Marriage to lead the couple in taking the original vows and renewing them in the context of a Catholic ceremony, thus making it a valid marriage in the eyes of the Church. Even in the shorter form, it is still a true wedding ceremony, including the readings of scripture and an appropriate homily. Depending on what the couple desires, they can exchange rings or have the original rings blessed as they wear them. The vows and readings for a convalidation are the same as the wedding ceremony. At least two other people need to be present to serve as witnesses and they need not be Catholic. Family and friends may also be invited to share the joy of the ceremony. Some priests will be open to more elaborate ceremonies that include traditional wedding music or a procession, but it should be clearly understood that an actual, legal wedding has already taken place prior to the convalidation. The bride and groom were legally married according to the state government, but not under the requirements of a Catholic wedding ceremony according to canon law, which all Catholics are bound to obey. The convalidation ceremony is not the time for the big church wedding with bridesmaids and a huge reception bulging with expensive gifts. But, because celebrating the Church’s official recognition of the marriage is still a joyous occasion, a get-together can be planned to follow the liturgical blessing. For whatever reasons couples choose to marry outside the Church and later seek to have their marriages blessed, the spiritual benefits of convalidation are obvious. Catholics approach the altar with peace of heart and mind, knowing they are coming back into full communion and are once again welcome to partake in the rich sacramental life of the Church, especially the reception of the Eucharist, with the Church’s assurance of God’s special blessing upon their marriage. Convalidation fulfills the need to get closer to the Church and to God and to build a strong foundation for the family. From an etiquette point of view, there really is no difference in the two terms. You would be reaffirming or renewing your vows to each other–basically the same thing. This is best done on a bench mark anniversary if inviting guests, though, as it could appear odd if done too early in the marriage. This is because there is nothing to “renew” or “reaffirm”. But, you definitely could have your marriage blessed by the church. This is not a wedding, but a simple ceremony for the church to bless your vows. Typically, the vows are different for a reaffirmation ceremony. After all, you are already married. So often the couple will create their own vows. Of course, you would have to discuss this with your officiant. The etiquette for your Convalidation would be the same as it is for all vow renewals. It isn’t a wedding. So, you would be expected to wear a nice dress that suits the formality of your event. It should be small with mostly family. Please read more about vow renewal etiquette. Of course, we have very, very many posts concerning this issue as well.